Just as the May 14 dismissal of New York Times executive editor Jill Abramson sparked a debate about gender roles in journalism, the ascension of Dean Baquet—the first African-American to run the paper’s newsroom—has renewed the focus on minority hiring in the news industry. If Baquet is an historic figure at the Times, he is also part of a small minority at U.S. news outlets. Our data analysis finds that in newspaper newsrooms, the percentage of overall staffers and supervisors who are black, Hispanic, Asian, Native American or multiracial has remained virtually unchanged in the past two decades—accounting for about one in every 10 positions. The situation is slightly different in broadcast news, where minority staffers are still vastly outnumbered, but their presence has, in some cases, risen modestly. 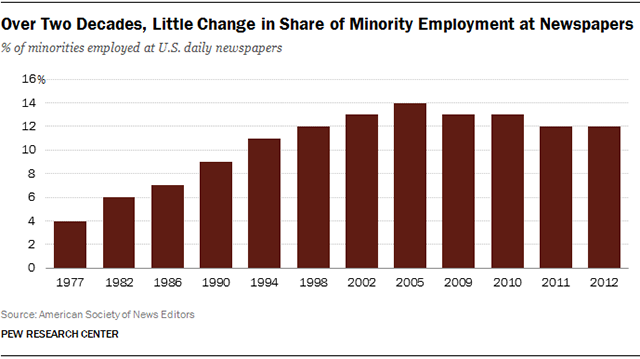 However, it’s worth noting that the percentage of minorities has not changed during a period when newspapers shed nearly 16,000 jobs. ASNE data indicate that the number of minorities employed at newspapers dropped to 4,700 in 2012, which is 1,200 fewer than in 1994. The percentage of minority supervisors in newspaper newsrooms has remained static for 15 years. In 2012, 10% of supervisory positions were filled by minorities, compared with 9% in 1997, the first year that data by job position were available. The real growth in hiring occurred between 1977 and 1994, when the percentage of minorities in newspaper newsrooms nearly tripled—from 4% to 11%. During that period, newsrooms made more deliberate efforts to hire more minority journalists and to work toward ensuring that the makeup of newsrooms was similar to the communities they cover. The industry got involved as well. The National Association of Black Journalists (NABJ) was formed in 1975 to, among other things, work on bringing more minority journalists into newsrooms. Three years later, in 1978, ASNE began a major effort aimed at diversifying the newspaper industry. In local TV news, minorities represent a larger percentage of the workforce than at newspapers, but that number has also remained largely unchanged in recent years. The RTDNA/Hofstra University annual survey found that minorities accounted for 21% of the news workforce at local stations in 2012. That is the same percentage as in 2004. The total percentage of minorities working in local radio news has increased from 8% in 2004 to 11% in 2012. These figures fell to a low of 5% in 2009, but rebounded since then, according to RTDNA data. The trajectory for minorities occupying news director jobs and general manager positions in local radio news has been a bit bumpy. Minorities held 10% of local radio news director slots in 2012 about the same as in 2004, when 11% of radio news directors were minorities, but that does represent an increase from 5% in 2010. Only 8% of local radio general managers were minorities in 2012, but that percentage is more than double what it was in 2004 (3%).